We all have different body types, and we all have different tool needs. 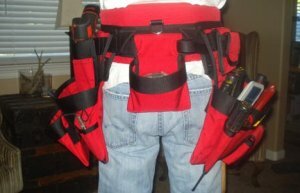 So what do you do if you just can't seem to find a toolbelt that has everything you want, exactly where you want it? You make your own, of course. That is... if you have a background in industrial sewing. m@tt over at the Contractor Talk message boards put cost, speed, and simplicity aside and decided he was going to start from scratch and make his own toolbelt. Putting his industrial sewing skills back to work, he designed and built one of the coolest toolbelts I have ever seen. He went all out on quality and used 3 layers of 1000 denier Cordura on all of the main parts, used Mil. spec webbing on the belt and as extra reinforcement, and topped it off with an all aluminum belt buckle. All of the bags are removable, so he can mix and match his pouches and layout depending on the job. And check out the spade bit and screwdriver holders. Amazing is all I can say. Full gallery after the Read More.